Last year, the day after my birthday party, I had planned a mariscos crawl. This was obviously a bad decision on my part. Seafood after a night of heavy drinking? 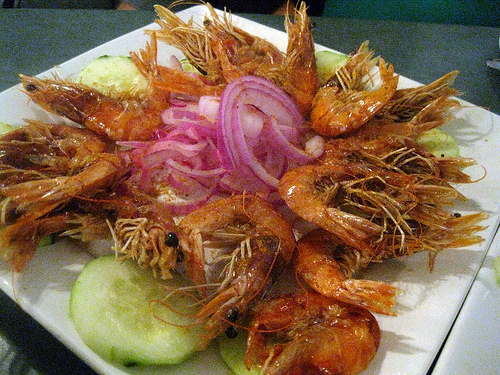 After having a few tacos and tostadas topped with not-so-fresh shrimp and imitation crab, we arrived at Mariscos Chente a little worse for wear. All right fine, I was the only one who might lose it if I had another shrimp. Yet, I’m the crawl leader. I have to go on. What I remembered was the spiciest green salsa known to me. It was evil. And that was just the salsa on the table for the chips. The menu is uncomplicated. Just one page of offerings written in both English and Spanish. 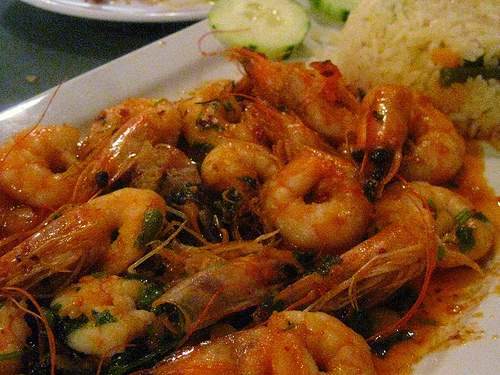 However, there’s not much description and the first time I went, I ended up with a plate of raw shrimp quietly cooking in that evil salsa. Oh right, I have to eat this. Fortunately my friends took pity on me and allowed me to swap some of my shrimpy shrimps for some of theirs. I did have to laugh when one of my former vegetarian turned pescatarian friends ordered fish and ended up with a whole fried fish. He had never had fish that way before and it was amusing to see him try to find some way to not touch the bones. 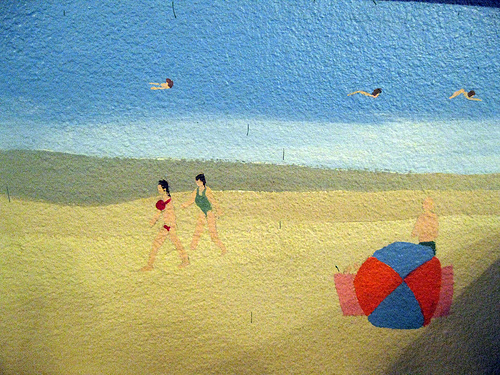 I had been meaning to go back to Mariscos Chente for a while. Partially to conquer my fear of the evil death salsa verde and partially because it was on the way to the airport where I was dropping off the gay boyfriend. I told him he probably wasn’t going to get this kind of food in Canada for a while. 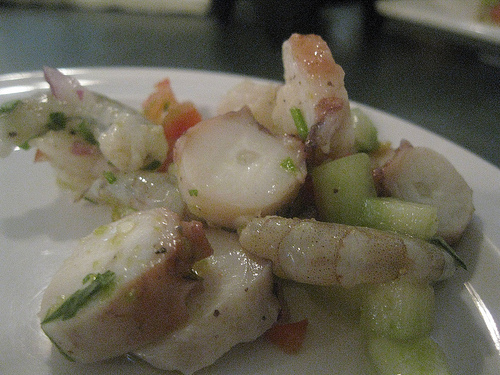 For an appetizer, we ordered the ceviche mixto and I loved the octopus. One friend ordered the crispy camarones (cucaracha) which I thought sounded like roaches. Turns out they were fried and crispy like a roach’s body? Uh, what? Well, anyway, they were good but I much preferred the gay boyfriend’s camarones borracho. You could taste the tequila in it. I wanted fish and only one had a description. I made sure to ask which fish wasn’t the whole deep fried one. I ended up with the tin foil wrapped fish that had been fileted. 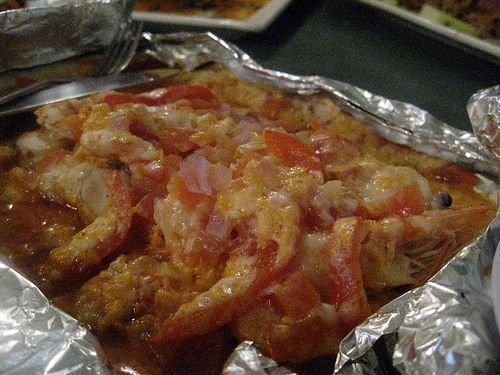 It was covered with slices of octopus and shrimp as well as cheese and tomatoes. It took a while to get and my friends were almost done but it was definitely worth the wait. I couldn’t stop eating the delicious rice either. I am forlorn that I have yet to kick my white rice addiction but at the time, I didn’t care. If I ever did a mariscos crawl again, I’m starting at Mariscos Chente and probably staying there for the duration.